This tool can be accessed by clicking on Trim button under Input Files on the Main screen or from the Input File Configuration screen. This tool displays and adjusts the starting and ending time indexes of an input file. 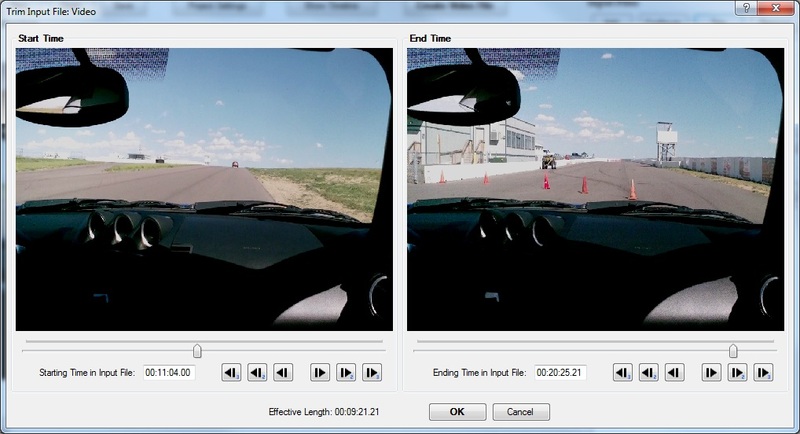 Start & End Frame Controls - Adjusts the starting and ending positions within this media file. If you use the buttons or bar to make adjustments, the corresponding preview window will be automatically updated. If you change the text box, press Enter to update the preview window. Starting Position in Input File - The starting offset within this media file. Anything before this time will not be shown in the current project. This can be used to adjust the synchronization of input files in the current project, but the Synchronization Tool is recommended for that purpose. Ending Position in Input File - The ending offset within this media file. Anything after this time will not be shown in the current project. If this time is "99:00:00.00" or anything else that exceeds the length of the media file, the file's actual ending time will be used instead. Effective Length - The effective length of this media file that will be used in the current project.